Sign up for Broadjam today to follow Confused By Zebras, and be notified when they upload new stuff or update their news! 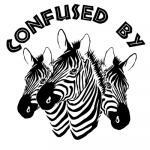 Confused By Zebras plays mostly original music.Marc Franz, a lifelong music artist and formerly of The Slip, In The Red and The Monkey Boys, has been writing his original music for many years now. Marc as writer, singer, and guitarist of Confused By Zebras has been looking for the right group to help develop and play his music.Three different drummers grace the recordings, but the drum chair is once again occupied by Marc's lifelong sidekick, Dave Lockhoff.